Twentieth Century Disease Maps and Geographers . Another important geographer preceding Pyle slightly was Jaques Mays. He was a cultural geographer first, a medical geographer second, and had a discipline somewhat similar to Pyle during his years of service as a World War II special information source. During the same time Pavlovski’s mapping of disease was becoming popular, Jacques Mays made use of the same skills that the early French medical military cartographers taught us, topography was one of the most important aspects of Nature that had links to disease patterns and behavior and climate and weather changes could make or break battles. Jacques Mays did much to popularize this look at disease following his service as a geographer during the Second World War. Disease behaviors within specific ecological and climatic settings became important, a discovery about disease mapping that played an important role as well in the next war to become a part of this country’s history–the Korean War. In 1957, Mays published his important work in this field, The Ecology of Human Disease. When Mays’ work was published, there was a fairly strong prejudice against the field of geography taking hold in American culture. For this reason, Mays’ book barely received its due attention. 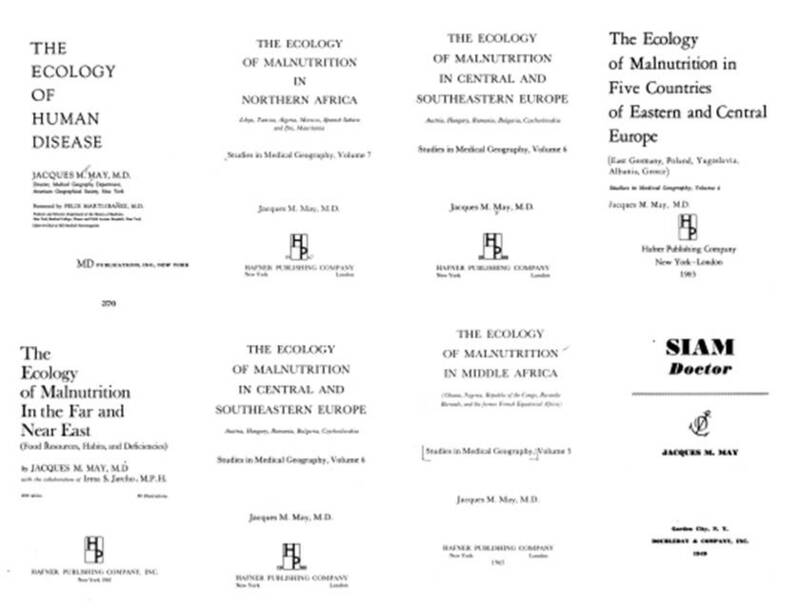 When the next major textbook in this field was published, Medical Geography, the authors essentially rewrote the content of this field and its books, eliminating some of the older philosophy retained in Mays writings (including determinism and some eugenics related philosophy), and added the impressions of others in this field more as pathologists, environmental specialists, ecologists and epidemiologists than as true geographers. This interpretation was more in the context of the earliest medical topographers, although with a different philosophical background this time due to the complete understanding of disease ecology and pathogen behaviors that were better understood over the past century. The next disconnect from the Jacques Mays period of medical geography came during the Cold War Era. Following the second World War and Korean War, there was a bit of a lull in the field of geography. Whereas Western European schools maintained this field of study and according to later writings Eastern European school kept it very active, the United States school system was slowly diminishing the study of “geography” per se, from its disciplines. A number of colleges dropped this from their curriculum completely, but due to its importance a number of regions, especially states, maintained heir geography programs due to the political and sociological purposes they served. Environmental Science or Earth Science replace the science and department of geography in some curriculums. During my freshman year of 1976, it is interesting to note that one of my Introductions to Earth Sciences professors required that we all had to learn all of the places on this list, and did not pass until we got those indicated on paper tags that were selected from a hat right. About 50 were tested each time, out of how many I cannot recall, but this list included all the countries, all the regions of certain continents, all of the major topographical places like rivers, deltas, mountains, valleys, deserts, ad nauseum. If you missed a single one of them you had to come back, even later on the same day. The Cold War Era closed the doors to much communications between U.S. and Soviet scientists. The paranoia setting in, along with occasional accurate nuclear threats and “events” made for little to no correspondence with Eastern European professors who managed to perfect their manner of engaging in a macroeconomic analysis of their massive contract, including all of its natural resources, its animals, and its zoonotic and anthroponotic diseases. When Gerard Pyle made turned the study of diseases into economic geography reviews of people and health as tempero-spatial phenomena dependent upon human migratory and economic migration patterns, he provided a unique perspective to the field of medicine and epidemiology previously unmatched by the older disease mappers. We can relate some of Pyle’s concepts to the maps of the past, which I engage in as a part of my thesis. But Pyle’s new interpretation brought back some human geography features previously missing from the earlier epidemiological interpretations that were published during the first half of the twentieth century. During the 1980s, as Soviet knowledge and influences were open to the world once more due to the fall of Marxism, We (or at least some of us) relearned and updated ourselves regarding the Soviet perspective of things. This could be balanced with the Western European and United States (America?) view of medical geography in such a way as to improve upon some very non-geographic ways of mapping disease and presenting your information in an Environmental Scientist way, not a Cultural Geographic way. In both maps and text, merging these two philosophies into one discipline almost happened by 1990. But at least a different set of knowledge is out there pertaining to Soviet geographical thinking. In view of Pyle’s work it helps to look back to the Soviet medical geography as told by Pavlovsky and Voronov. Soviet Influence Just prior to Pyle’s work were the most important contributions made to disease mapping by Russian scientists Igor Pavlovski and Voronov. Their focus on the spatial behavior of disease maintained that spatial and ecological perspective eluded to by most of the prior cartographers noted here. Whereas Western Europe and American geographers seemed to be turning away from medical cartography and spending more time with microbiology and microbial ecology, the “microcosm” so to speak, Pavlovsky and later Voronov focused on the “macrocosm”, and the complex zoonotic or animal dependent nature many diseases demonstrated. They focused on the larger organisms, the insecta and the like, for animal disease with and without human relationships. Pavlovsky’s work essentially defined the science of parasitology, a science which farms and residences in the USSR had more opportunities to witness and experience, in more forms and resulting diagnoses than much of the rest of the world. Pavlovski’s work has received considerable review from Western European epidemiologists and academicians, but Voronov’s have unfortunately been almost completely overlooked. Since Voronov was the successor to Pavlovski, this prevented the important contributions Russian disease cartographers and ecologists already had on this field from advancing much further. Voronov’s work added substantially to the natural ecological interpretation of disease in terms of microorganism or pathogen, host-vector relationships, and most importantly, definition of areal limitations that each of the steps that the disease ecology and migration processes take. Voronov perfected the macroecological behavior of disease much like other Russian geographic interpretations perfected the macroeconomics view of world business and finances, defining zoning patterns related to hosts, carriers, vectors and human victims of disease, a method of spatially presenting disease not reproduced with similar success by Western European epidemiologists, and when produced, tend to represent the rediscovery of past accomplishments rather than an addition to past successes produce by the medical geographers.